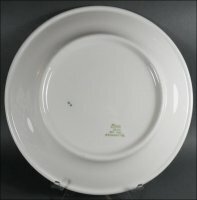 Home » MAYER China » Mystery CC Plate: Horseshoes, Whip, Harness Racing? 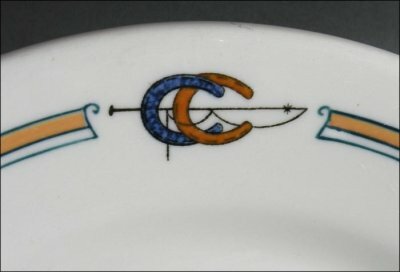 Mystery CC Plate: Horseshoes, Whip, Harness Racing? We've asked around about the plate and so far its logo is an enigma. The CC, which likely are the initials of a club's name that begins with C, seems to be designed from a pair of horseshoes, with the addition of what has been described as a carriage driver's whip. 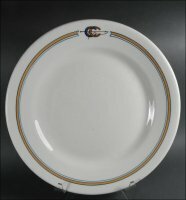 Made by Mayer China, probably in the 1930s-40s date range, it is 9 5/8" in diameter and has the curlicues on the border frequently associated with 1920s designs. It is in excellent condition with medium utensil and stacking marks but no chips or cracks.